Everybody complains that art, design and research in information visualization should be talking more to each other. 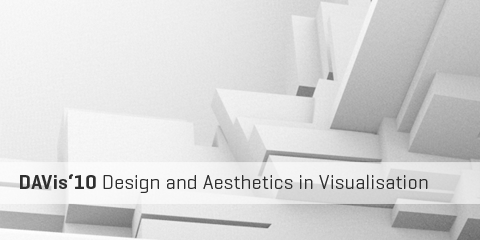 Here is a unique opportunity: Andrew Vande Moere and I will be hosting a symposium at IV10: DAVis, the 5th International Symposium on Design and Aesthetics in Visualisation. “This symposium aims to bring together researchers and practitioners of design, art and related disciplines. The goal is to share their stories and experiences on how the needs and goals of both users and businesses are met through information visualisation. It supports the publication of research in two general domains: Design and Aesthetics. Design refers to the development of visualisation as a creative design process. Aesthetics refers to the role of user experience in visualisation, as understood in three distinct components: aesthetic experience, experience of meaning, and emotional experience. So – designers, coders, artists, visualizers – go forth and write! Update: make sure to check out the submission requirements and procedure up at the IV main page. Beware: the deadline is tight: March 1. March 21 But honestly, you would not have started earlier, anyways – right? Feel free to get in touch if you have any questions, and we are really looking forward to your submissions.